Historic Williamsburg Village. See and learn what life was like 200 years ago. Explore dozens of Historic Area sights: The Capitol, Raleigh Tavern, all Gardens, Trade Sites (Blacksmith, Wheelwright, Silversmith & Wigmaker), Great Hopes Plantation, Courthouse, Gaol, Peyton Randolph House, George Wythe House and much more! Admission to Jamestown Settlement. 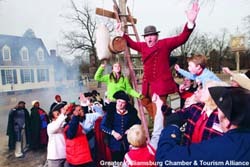 Visit America�s first permanent English Colony, exhibition galleries, orientation film, orators recreate life in the 1600s with recreations of colonists fort and the three ships that brought them in 1607; explore the museum and Powhatan Indian Village. Admission to Yorktown Victory Center. This visit chronicles America�s struggles for independence. Exhibits depict accounts of the American Revolution; even muster with troops in a Continental Army encampment. Great on a stand-alone basis or in combination with a Washington DC package! Seasons and rates vary considerably in Williamsburg. Please let your travel agent know exactly what you want and we will work with them to completely customize your visit! Built by John D. Rockefeller, Jr. in 1937, the Williamsburg Inn reflects today what its founder envisioned: a charming country inn providing the most modern, gracious accommodations. This stately, full-service hotel pampers all its guests with royal treatment. 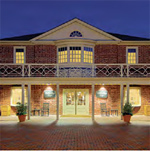 Listed on the National Register of Historic Places, the inn is adjacent to the Colonial Williamsburg Historic Area and the Golden Horseshoe Golf Club. Savor distinctive food and wines in the renowned Regency Room for regional favorites. Enjoy cocktails and conversation in the clubby ambiance of the Restoration Bar. The Terrace Room is perfect for traditional afternoon tea. Renewed and restored in 2007, the Williamsburg Lodge offers guests a generous helping of southern hospitality with impeccable service and a choice of comfortable accommodations in either the all-new, Federal-style guesthouses, the renovated Tazewell Hall, or the restored main Lodge building. Furnishings are inspired by art from the nearby Abby Aldrich Rockefeller Folk Art Museum. 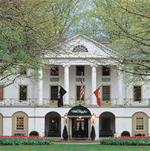 One of the two original hotels envisioned by John D. Rockefeller, the property has now matured to comprise eight buildings, interconnected by sheltered, brick-paved walkways. American cuisine at the Lodge Restaurant. Cocktail at the Lodge Lounge. 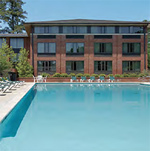 Set near a pine grove adjacent to Colonial Williamsburg�s Visitor Center, Williamsburg Woodlands Hotel & Suites is a family haven with recreational choices�miniature golf, shuffleboard, table tennis, bike rentals, and swimming. Plus, a continental breakfast buffet is included in the room rate. Walk or shuttle to the Historic Area. Rooms feature two full-size beds, a sitting area with desk, and a comfortable lounge chair.